Here are the lessons I’ve learned from four years of running a conference. What fun is making something if you can’t enjoy it? For years I stressed and worried about Tribe Conference when I had no reason to do so. My anxiety didn’t make my work better, and it robbed me of the joy of the experience that so many others were benefitting from. This year was different. In years past I had heard people tell me how meaningful the event was for them. But this year I actually experienced it myself. Gone are the days of my ambitions to build things. I’ll leave that to someone else. I just want to enjoy life and share meaningful experiences with other people. Everything I’ve ever built, I’ve felt the pressure to grow and scale and maintain. There’s a false sense of ownership when we seek to build something instead of facilitating an experience. The reason our little event seems to work so well, I think, is because we just try to hold a space for people to do their thing. We aren’t building anything. We’re just giving people a reason to share an experience together. For years, I wanted to keep growing Tribe into something other than what it was supposed to be. Something powerful happens when you realize who your work is for and who it is not for: you get to just do your dance without worrying about everyone liking it. 2019 will be the last year for Tribe Conference. The reasons for this are many, and I’ll get to that in another blog post, but suffice to say I always thought this would only last five years. I’m excited to wrap up this chapter and start a new one. But before we end this thing, we want to have one last party to throw… and you’re invited! 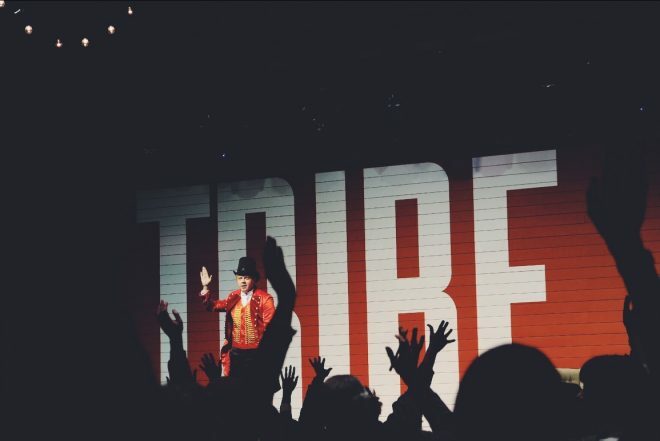 Tribe 2019 will be our best event yet, and I don’t want you to miss it. Click here to reserve your ticket to Tribe Conference 2019. We’ve already reserved The Factory again for next year (September 6-8, 2019), and we are starting to secure the speaker lineup. Can’t wait to see you again next year for the big finale!